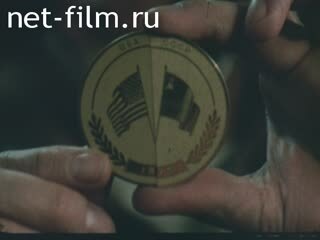 A film about the cooperation of the USSR and the United States in the exploration of outer space and its use for peaceful purposes. The film reflects the program "ESPAS" at all its stages: preparation, flight, return to Earth of the Soviet and American crews of the Soyuz and Apollo ships. Specialists of the Flight Control Center (MCC) at the control panels. The launching spacecraft on the screens of monitors, American and Soviet specialists congratulate each other. Employees of the MCC receive a message from Leonov AA from the Soyuz-19 spacecraft about the readiness to meet with the American ship Apollo. Journalists transmit messages to newspaper offices. Issue in the printing house of the next issue of the newspaper with a report on the launch of the Soviet spacecraft. American spacecraft at the launch of the space launch them. Preparation of American astronauts for the launch. Astronauts go to the launch pad. Panorama of the control room of NASA. The launch of the Apollo spacecraft. The audience watches the start. Employees of NASA are watching the flight of "Apollo" journalists are reporting from the control room. Convergence and docking of Soviet and American spacecraft. Newsreel of 1945: a bridge across the Elbe River in Germany. Meeting of Soviet and American soldiers on the Elbe on April 26, 1945. NASA employees congratulate each other on successful docking. People buy newspapers in kiosks on the streets of Moscow, read a message about a Soviet-American meeting in space. A solemn meeting at one of the enterprises on the occasion of the docking of the Soyuz and Apollo spacecraft, speakers come from the rostrum. The opening of the transitional hatchways of spacecraft, the meeting of the Soviet and American crews, people are watching a broadcast on a television about a meeting in space. Members of the Soviet and American crews exchange souvenirs, conduct photo and filming of the meeting. The signing of the first international document in space. Orbital station "Salyut-4" in outer space. Cosmonauts Klimuk P.I. and Sevastyanov VI congratulate the participants of the world's first international space flight from orbit.